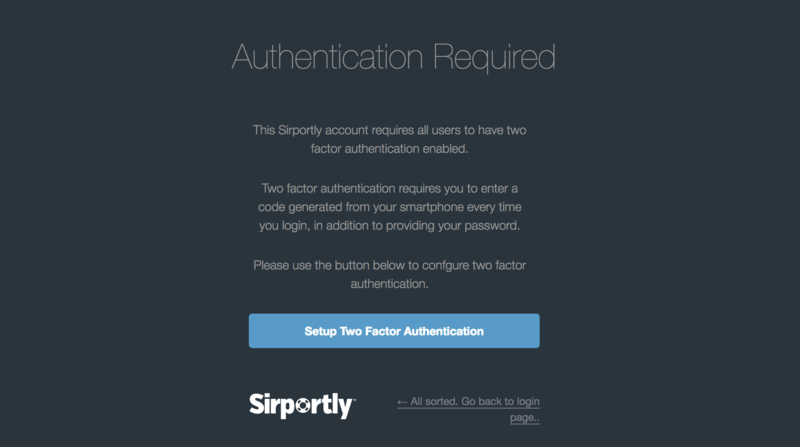 Starting today, administrators in Sirportly can enforce Two Factor Authentication (2FA) on all staff member accounts, meaning it must be set up before they can login. Additionally, administrators can easily monitor which staff members have it enabled in the Staff & Users area in the Sirportly admin interface. Users with 2FA disabled will show a grey key next to their names in your users list, and with a gold key when enabled. Two Factor Authentication enforcement is not enabled in Sirportly accounts by default, but it can be setup simply by navigating to Admin -> Company Settings, then enabling the checkbox. Once this has been done, users will see a prompt when they next login to set up 2FA if they haven't previously done so, using our single sign on service, aTech Identity. I'm Adam W, or as everyone prefers to call me ‑ Batman. I get a lot of satisfaction out of helping our customers and am committed to making their customer experience as positive as possible. When not offering support to our customers, you'll find me gaming, listening to music or running. Sirportly is a customer helpdesk platform which is packed with advanced features that any company needs to delivery customer support excellence. Every new post we publish is sent straight out to our Twitter feed. Follow us there so you don’t miss a thing. Our twitter handle is just @sirportly.